Building Performance Evaluation (BPE) informs and enhances the usability and sustainability of building designs with lessons learned from evaluation of building performance throughout the building life cycle, from initial planning through occupancy to adaptive re-use. A key feature of BPE is that it examines design and technical performance of buildings alongside human performance criteria. That is, it seeks to examine facilities in order to determine whether they will work for the people that will use and occupy them. Rigorous BPE helps to improve design practice by providing feedback on the effectiveness of the choices made about the building to ensure that its design is optimised for stakeholders’ uses. The overarching theme for Enhancing Building Performance is to present the next generation of BPE work. The book provides an updated systematic approach for BPE as well as chapters written by experts from around the world who demonstrate how to apply BPE to enhance building design. Topics covered include: evidence-based and integrative design processes, evaluation methods and tools, and education and knowledge transfer. In addition, case studies provide specific examples of how BPE has been used to study such things as the impact of workplace design on human productivity and innovation. 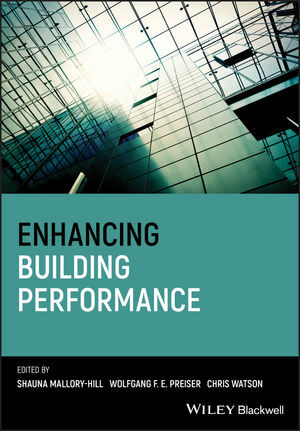 Written primarily for design professionals and facility managers who wish to use BPE to deliver improved building performance that is responsive to the needs of stakeholders, Enhancing Building Performance will also be of great value to researchers and students across a range of architecture and construction disciplines. Shauna Mallory-Hill, PhD, M. Arch, B.E.S., LEED AP BD+C is Assistant Professor in the Faculty of Architecture at the University of Manitoba, Canada. With nearly two decades of research and teaching involvement in the discipline of building performance evaluation, she is the co-ordinator for the International Building Performance Evaluation research consortium which facilitates the work of BPE practitioners around the world. Wolfgang F.E. Preiser, PhD, M.Arch, Dipl. -Ing is Professor Emeritus in the School of Architecture and Interior Design at the University of Cincinnati, USA. He has 35 years experience in teaching, research and consulting, lecturing around the world, and publishing 18 books. Christopher Watson, BSc, B.Arch, ANZIA, BOAQ is an Architect with considerable experience in evaluating a very wide range of building types in diverse situations.